I am using JotForm to create a form to fill out for an event, and I have it automatically respond to the parents who's teens have signed up for this event. I also have an notification email set up, but for some reason, I am not recieving these notification emails. The notification is going to a different address other than the primary one that is registered. 1 - Select "Setup & Embed" tab from the form builder. 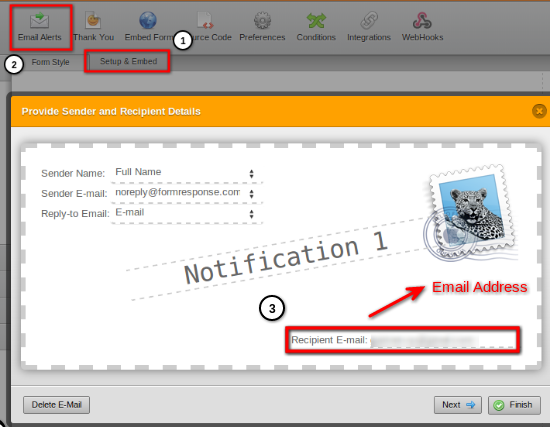 2 - Click on "Email Alerts" icon, then select "Notification 1" from the email alerts list. 3 - Check the recipient E-mail input , if it is not correct you can change the email address here. Click finish and make a test submission to see if it is working. Went through all of that alrady, and it seems to still not work. One of our developers, Eliezner, was testing my form for a different problem, and it was submitted, but I never got an email notification about this test. Could you provide us with the email addresses that are not receiving the email notifiactions in order to make further investigations? Sorry for the inconvenience that may have caused. I've check your email address and its not on our bounce list. Have you tried already checking your email spam/bulk folder? If not, can you please give a try?